“It is not a novel that should be thrown aside lightly. Wikipedia: Atlas Shrugged. Kirkus review "... and one can count, too, on ... the intellectual snob appeal of those who like to feel they've plumbed a new code of ethics ..."
The novel was generally disliked by critics. Rand scholar Mimi Reisel Gladstein later wrote that "reviewers seemed to vie with each other in a contest to devise the cleverest put-downs". One called it "execrable claptrap", while another said it showed "remorseless hectoring and prolixity". In the Saturday Review, Helen Beal Woodward said that the novel was written with "dazzling virtuosity" but was "shot through with hatred". Granville Hicks in The New York Times Book Review, said the book was "written out of hate". The reviewer for Time magazine asked: "Is it a novel? Is it a nightmare? Is it Superman - in the comic strip or the Nietzschean version?" In the National Review, Whittaker Chambers called Atlas Shrugged "sophomoric" and "remarkably silly", and said it "can be called a novel only by devaluing the term". The writer John Rogers said: "There are two novels that can change a bookish fourteen-year-old's life: The Lord of the Rings and Atlas Shrugged. One is a childish fantasy that often engenders a lifelong obsession with its unbelievable heroes, leading to an emotionally stunted, socially crippled adulthood, unable to deal with the real world. The other, of course, involves orcs." 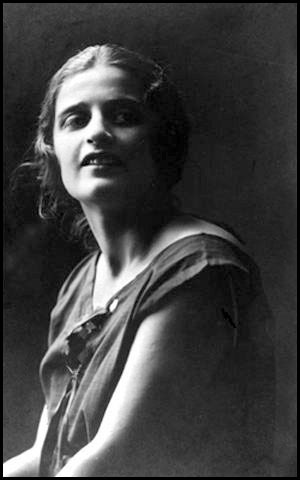 A Critique of Ayn Rand and “Objectivism"
"The so-called philosophy of Ayn Rand, known as Objectivism, has become a rather odious cult in the United States. Europeans find it baffling, while academic philosophers use it as opening for easy jokes. If a philosophy conference is getting especially dull and grim you can simply say the name Ayn Rand and you will get at least a few amusing jabs at her. "Followers of Rand are impervious to any criticisms of her work however. When one mentions the obvious problems and contradictions in her work they are greeted with an almost religious parroting of her maxims. Maxims are really all they are (and I am grateful for one of them, see above, CB) because Rand rarely gives justification for any of her claims but simply states her point of view as emphatically as possible and then she (or her followers) accuses anybody who disagrees as being irrational ..."
The article is lengthy, very lengthy (and obviously controversial) ... but enlightening reading nonetheless, for anyone interested in philosophy and epistemology (the theory of knowledge; epistemology is the investigation of what distinguishes justified belief from opinion). "Academic philosophers have mostly ignored or rejected Rand's philosophy. Nonetheless, Objectivism has been a significant influence among libertarians and American conservatives." The reason why I was interested in Objectivism is that Rand characterized it as "a philosophy for living on earth", grounded in reality, and aimed at defining human nature and the nature of the world in which we live. The name "Objectivism" derives from the idea that human knowledge and values are objective: they exist and are determined by the nature of reality, to be discovered by one's mind, and are not created by the thoughts one has. 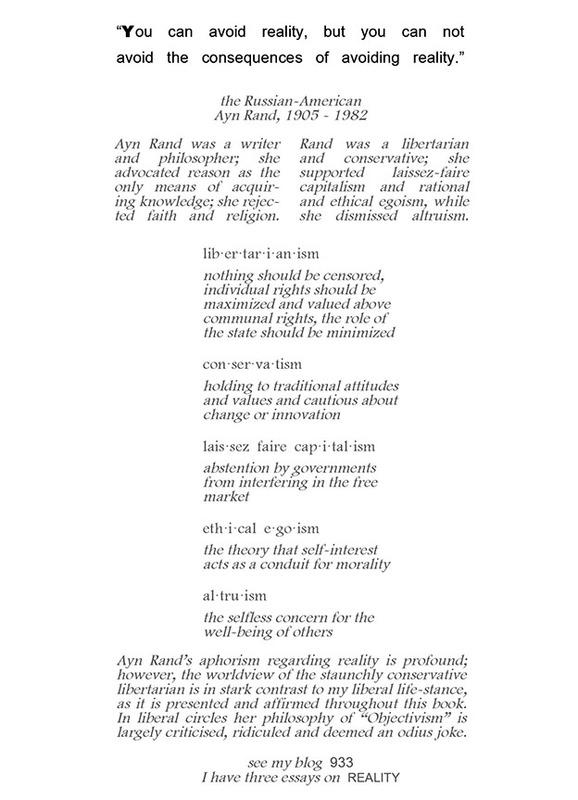 The reason why I am blindsided by Rand is that this seems ever so reasonable ... until one realises that at the core of her philosophy is "the concept of man as a heroic being, with his own happiness as the moral purpose of his life", which leads to laissez-faire capitalism with its denial of altruism. Conservatives and libertarians (in America politician Paul Ryan and Justice Clarence Thomas) wallow in this sort of unsociable ideology.